Republicans coming together Apparently Trump was a bit too optimistic about the cooperation he was helping put together. A better negotiator Trump knows what kind of president we need. When it came to the health care bill, every time he tried to negotiate, things got worse. 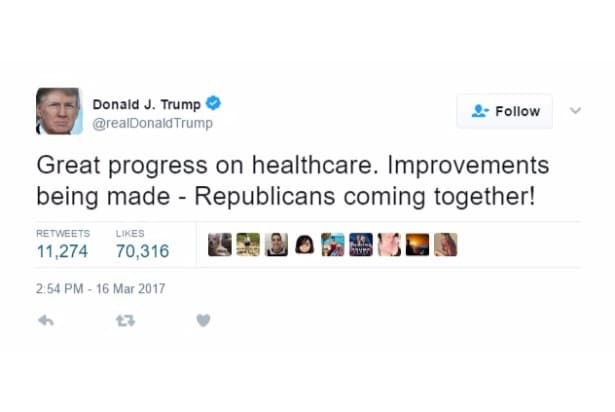 And it was never in line with his campaign promises. Maybe he forgot the leverage Trump tried to force Republicans to play ball with an ultimatum. Apparently he didn't have the kind of leverage he mentioned in his book. Sometimes you have all the cards... This one is pretty delightful when applied to the current situation. Republicans have the presidency, the Senate, and the House of Representatives. Even with the deck stacked, he and Paul Ryan couldn't put the bill over. Maybe he needed more gold Business is one thing, but trying to get your party to back a bill nobody likes operates under a different set of rules. "FAKE NEWS!" Trump tried to spin the stories of failing negotiations with his usual disdain for the media. Hard to blame the "fake news" when Republicans aren't even willing to vote on the bill, though. The goods Then again, he knows you need to deliver the goods. The American Health Care Act is not it. The Great Negotiator Trump puts a lot of stock in his negotiation skills, but walking away with a big check in the loss column makes this a pretty rough self-own. 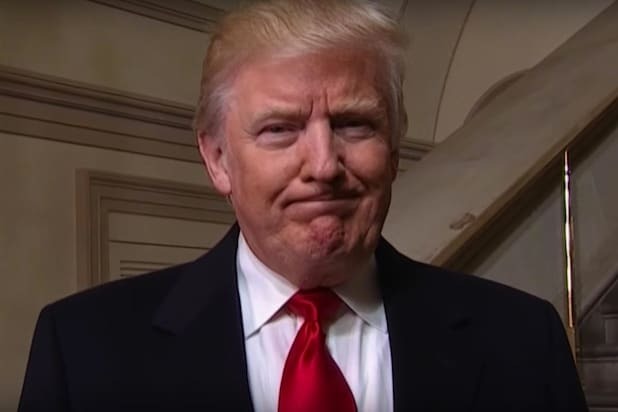 The only one who can do it Trump's constant assertion that nobody else could possibly make the deals necessary to repeal and replace Obamacare didn't turn out to be accurate. 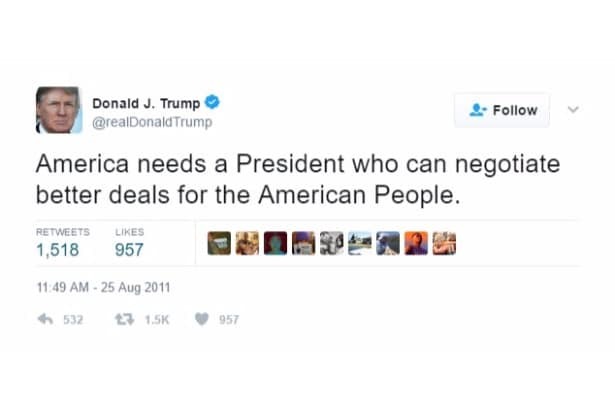 Turned out he wasn't the right person to make the deals, either. It's your chance Trump insisted this was the chance for a better health care plan. Nobody bought it -- including Republicans. Don't be desperate With advice like this in his book "The Art of the Deal," it might have been a good idea for him to re-read his own material before trying to force the vote on the bill. Be flexible Stories of the health care bill negotiations suggested Trump was anything but flexible. Reportedly, he gave Republicans an ultimatum to push the vote. It didn't quite work out. Or maybe it's all a ruse? There are plenty of Trump supporters who think failing to "repeal and replace" is actually a long-term secret plan. Maybe he's playing the long game? Bonus: Sean Spicer own Spicer has a few choice tweets from back during the Obama administration that he probably wouldn't want anyone to bring up again. Here's one.